We love a classic black and white bride and groom portrait, especially when the couple is as happy and in love as this one. 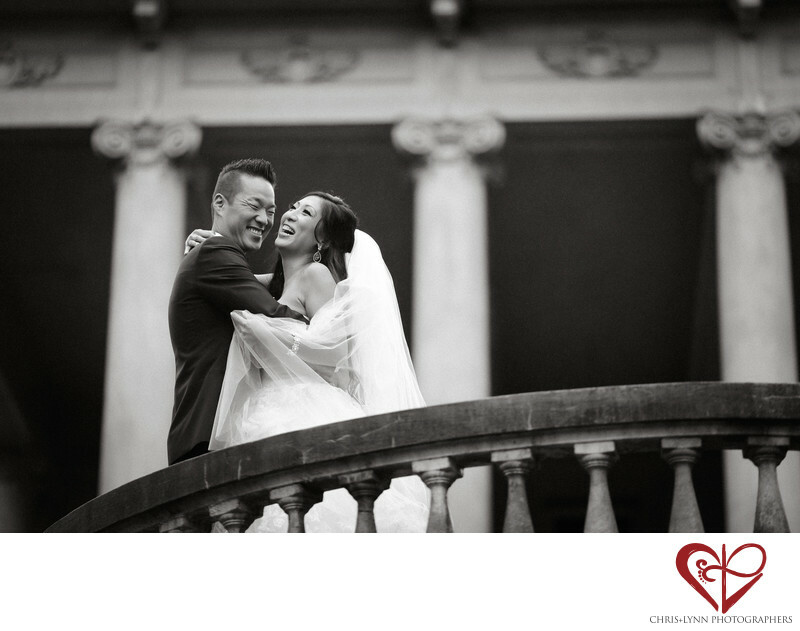 This image was shot on a typically overcast and rainy December day in Vancouver at the popular wedding venue of Hycroft Manor. The historic mansion is situated in the prestigious Vancouver neighborhood of Shaughnessy. A frequent set for movie and tv filming and the site of many high society parties and balls, it is also rumored to be haunted with seven ghosts. The 20,000 square foot property with 30 rooms was the perfect setting for this couple's winter luxury wedding in Vancouver. The bride got ready in the vintage dressing room overlooking the gardens and walked down the "aisle" of the home's famous triple staircase with pillars. Beneath the elaborate crown moulding and chandeliers of the living room, they said their vows in an intimate family ceremony. Afterwards, portraits were taken in the famous stained-glass windowed "green room", in in the sunlit blue-tiled Farris Solarium, and among the pillars of the dramatic terrace which lead to this famous spot, the "Juliet" balcony. The couple then celebrated with all their friends and family at The Rosewood Hotel Georgia. One special touch was the groom's gift to the bride of 1000 red roses that greeted guests as they entered the lavish ballroom. This winter luxury wedding with ceremony at Hycroft Manor and reception at The Rosewood Hotel Georgia was featured in the print edition of Wedluxe Magazine - see more here http://wedluxe.com/story/ray-tony/ . Location: 1489 McRae Ave, Vancouver, BC V6H 1V1, Canada University Women's Club of Vancouver,. 1/320; f/2.0; ISO 800; 135.0 mm.